FAQ: Can you store water tanks in crawl spaces? Question: A visitor wanted water storage in a crawl space and wanted to know if a small collapsible tank could be used for storing water in a crawl space of a house. His goal was to heat up the water with solar collectors to emit heat overnight in the winter. The visitor also was curious to know if the tank needs to be empty for repair and if he could do the repair himself. A concern was how the tank fabric would perform upper limits heat wise. Answer: Thank you for contacting us! We do offer flexible storage tanks that can be used for crawl spaces and low profile locations. Depending on your available storage location, many of our tanks may already be equipped to fit in your described storage space. Smaller tanks in the 25 gallon to 1,000 gallon range will typically feature shorter heights up to 16 inches for low-profile storage in your location. As seen in the temperature range, tank fabrics are available for hot temperature storage with fabrics available to handle temperatures as high as 180°. In order to make sure that these fabrics are compatible with the temperature you need to store, please let us know what temperature you need the tank to be able to handle. The option to repair the tank "in action" is depending on the size of the leak but to empty out the portable tank is always best. If the leak on your tank is too large, the proper tank repair kit will allow the tank to be fixed by the customer. Tank fabrics are typically chosen based on the liquid you are looking to store in the tank and your storage duration. Thicker fabrics may be used to offer long-term storage or extended use in demanding locations. 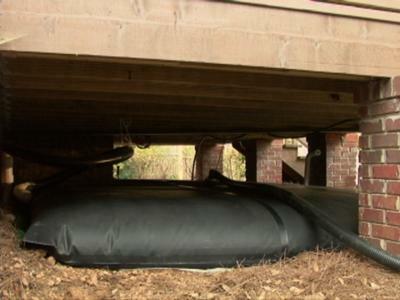 Learn more about Flexible Tanks for Water Storage in Crawl Space.